Yesterday, I got a wonderful email from a woman who viewed my series of Youtube videos on how to make Bucilla felt kits. 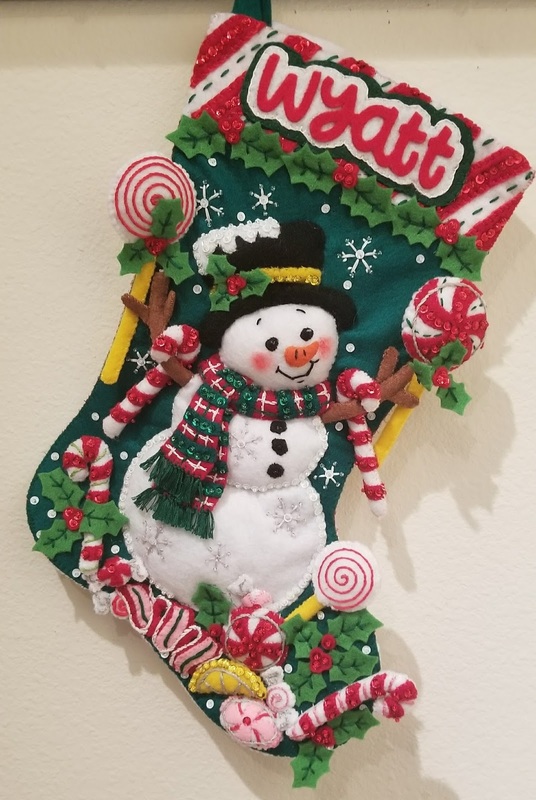 She shared her completed project and I found her way of making the name for the stocking wonderfully unique. The instructions call for embroidering the name but she did her's as a felt applique. Love it! Of course, I thought....why didn't I think of that? I learn so much from others when I share. My latest landscaping project is a success. I used plant support cages to block of an area of lawn that needed to be leveled and reseeded. With two young, large dogs in the family, keeping them off the new dirt was the toughest part. After three weeks I had a good crop of grass and one weed in the middle. My perennial flower garden is bursting with color. My only frustration is the delphiniums I planted have turned out to be white...usually they are purple. I want purple. Roughly, 71 x 89. The pattern is Chain Log Cabin from the book, "Moda All-Stars Scraps Made Simple," designed by Laura Boehnke. I also got the first set of pillow shams completed. Happy Dance!!! So much has been going on...one not good thing was our cat went missing...four days. I was so sad...and then he came home! We have not been letting him go outside except in our enclosed dogrun. He seems to be okay with being an inside cat. I think he is close to 20 pounds now and a little over a year old. He looks perfectly healthy...guess he was just enjoying hunting for a few days. Kind of hard to work on my computer when he decides to spend some quality time with me. I am so happy he made it back home from his adventure. It has been a while since any actual quilting has taken place in my world. The rain clouds broke up and I have been outside most days...but I ran out of energy for landscaping so I took a couple of days off to bond with my midarm. I have four shams to match quilts I use regularly on my bed. The bed quilts are both seven years old...hopefully I will get these made into pillow shams before the quilts turn eight. I used a simple muslin fabric for the backing as the backside will be completely covered once the shams are constructed. I got really hung up on what to "quilt" on the Iditarod shams. Finally I decided done was better than exciting! They are just pillow shams!!! I love these feathery designs...something so eye catching about combining the straight lines with feathers...and making little frames inside of frames. Love these. I am going to wash the quilted sham tops before I do the final pillow sham construction. Something I have learned from experience. Though, this time I used dream puff batting which doesn't do a lot of shrinking. Here's a peek at one of my hanging baskets. Our summer started with grey skies and rain so the coral geraniums in the center of this basket gave up on showing themselves. Still pretty! I have been working in the evenings on a set of Bucilla ornaments that go with a Christmas stocking that features a gnome. Pretty darn cute!